Being that maple syrup is produced by simply boiling the springtime sap of mature trees growing in the forest, wouldn’t it only make sense that it is organic by nature (Learn More: The Hidden Truth About Maple Syrup)? Well, I don’t know about you but I certainly would think so! However, there is something sinister lurking among the pure maple syrup bottles on the shelves at your local grocery store. 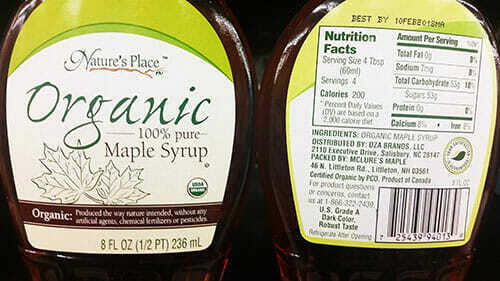 And you should beware of these “maple syrup-like” products. These products are certainly cheaper, so I can see how that can be tempting. But after learning more about the ingredients in these maple impostors, I hope you will now think twice. 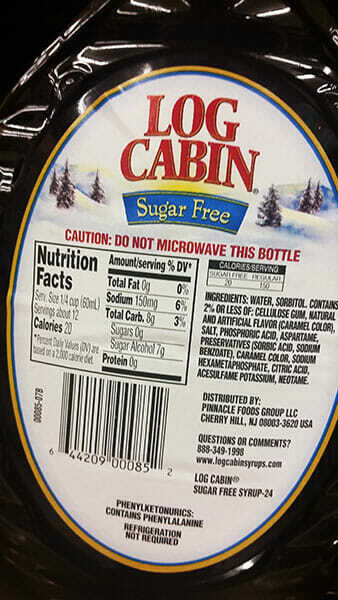 Log Cabin: corn syrup, liquid sugar (natural sugar, water), water, salt, natural and artificial flavors (lactic acid), cellulose gum, preservatives, sorbic acid, sodium benzoate, sodium hexametaphosphate, caramel color, phosphoric acid. Aunt Jemima: corn syrup, high fructose corn syrup, water, cellulose gum, caramel color, salt, sodium benzoate and sorbic acid (preservatives), artificial and Aunt Jemima natural flavors, sodium hexametaphosphate. Where is the maple syrup?! Did you notice that none of these contain anything, well, maple! Okay, okay, technically they don’t say “maple syrup”, but nonetheless they obviously want you to believe that it is. Otherwise, they wouldn’t use similar packaging and names like “Log Cabin” and “Aunt Jemima” with a picture of pancakes! 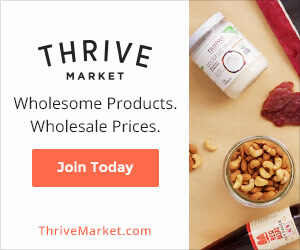 Rather than using the real deal, they use genetically modified sugars, thickening agents, emulsifiers, artificial flavors, and synthetic food dyes in an attempt to achieve the same flavor, texture, and color. 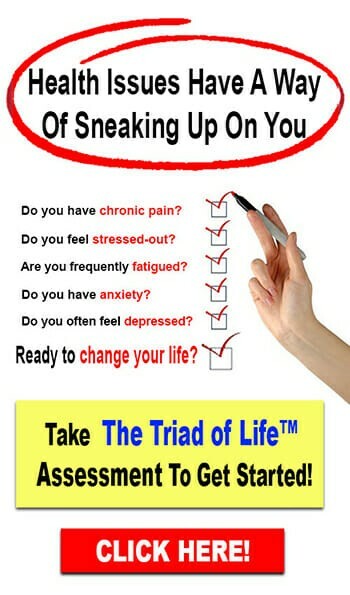 There are certainly no health benefits here! Just the opposite in fact—most of these ingredients have known health risks. Corn Syrup produced from genetically modified seeds with unknown long-term effects. 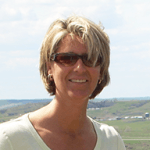 As evidence of the dangers of GMO foods grows, so does the controversy. 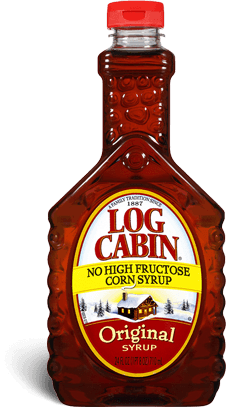 Note: Log Cabin clearly states on the bottle “No High Fructose Corn Syrup”, yet the first ingredient listed is corn syrup. Though they are technically a bit different being that corn syrup is 100% glucose and high fructose corn syrup is about 45% glucose and 55% fructose (depending on the product), both are still highly processed sugar that originates from genetically modified corn. Sodium Hexametaphosphate has been associated with respiratory irritations such as coughing, shortness of breath and mild chest pain. Sodium Benzoate is another synthetic additive. 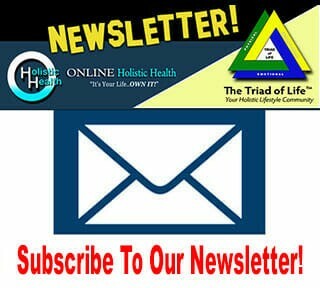 Research suggests that Sodium benzoate may contribute to ADHD-related symptoms. Caramel color has been shown to cause cancer in animals. Sugar-Free: water, sorbitol. Contains 2% or less of: cellulose gum, natural and artificial flavor (caramel color), salt, phosphoric acid, aspartame, preservatives (sorbic acid, sodium benzoate), caramel color, sodium hexametaphosphate, citric acid, acesulfame potassium, neotame. And as if this wasn’t bad enough, there is also a sugar-free version that includes even more toxic chemicals. Let’s look at one such example. Acesulfame Potassium is an artificial sugar. 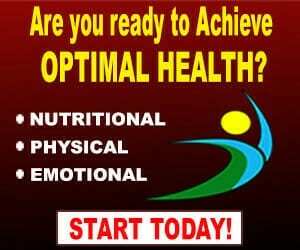 Research has suggested that this ingredient may cause cancer. Aspartame is associated with inducing arrhythmia and sudden death as reported by multiple sources. So what is the alternative? 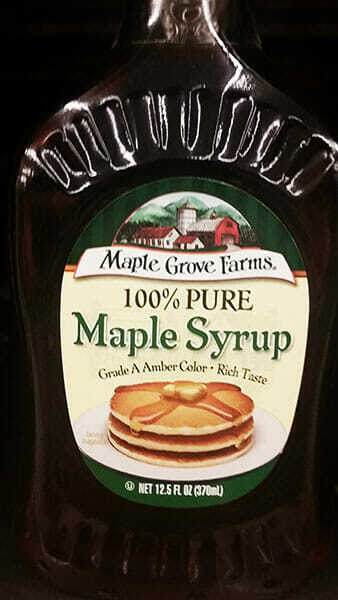 How about REAL 100% Maple Syrup! So just like anything else you purchase for consumption, be sure to read the label on the bottle to assure you are getting the natural stuff – real maple syrup made simply from the sap of a maple tree and boiled in a sugar house, not the kind made in a processing facility! 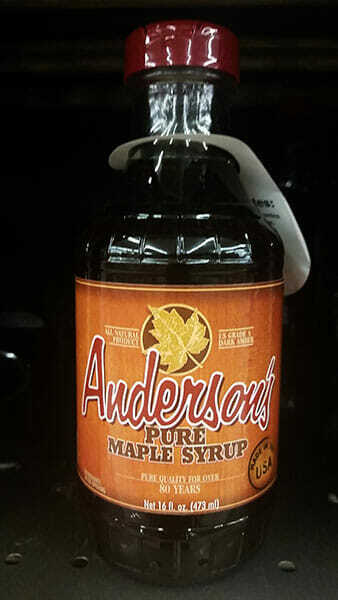 The ingredient list should contain only one ingredient: pure maple syrup! 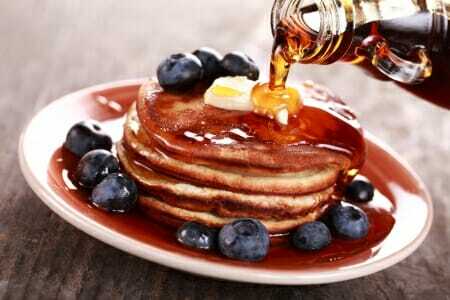 Now that you know that maple syrup is so much more than just a sweet pour to dress up your blueberry pancakes, consider taking advantage of the health benefits on a more regular basis! Drizzle it over butternut squash, carrots or Brussels sprouts before roasting. Add it to plain yogurt along with some organic granola. Drizzle over a baked apple for a sweet and healthy dessert. Sweeten a cup of tea. So why not do yourself a favor, and the next time you want to enjoy the rich sweet flavor of maple syrup along with its amazing health benefits, make sure that you are buying the real thing – 100% Pure Maple Syrup!